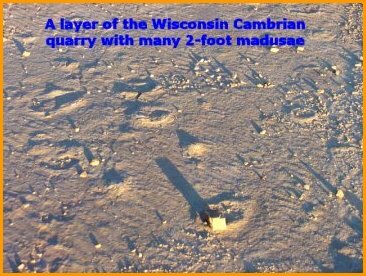 Near a sleepy rural burg named Mosinee, some 200 miles northwest of Milwaukee is a commertial flagstone quarry that may help fill in some pieces in the Cambrian puzzle. Among the fossils and trace fossils found in this quarry are numerous circular impressions in layers of rippled sandstone where there once was a shallow tropical seashore during the Cambrian. 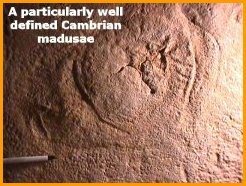 In the February 2002 issue of Geology, Hagadorn, Dott and Damrow publish a paper titled: "Stranded on a Late Cambrian shoreline: Medusae from central Wisconsin". The implications are of some note to paleontology since such huge Scyphozoan medusae (jellyfish) were likely to have been one of the largest and fiercest predators in the early Paleozoic. According to Hagadorn, the jellies from the Mosinee quarry are not just large for the Cambrian, but are the largest jellyfish in the entire fossil record. The quarry contains different layers with densely populated impressions the likely result of a mass-stranding of groups of madusae on a Paleozoic shoreline. 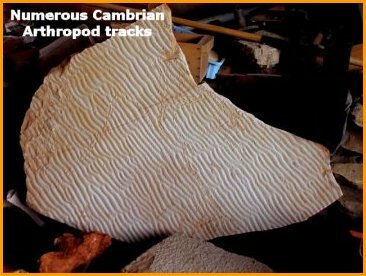 Such strandings frequently still occur on Earth, but in the Cambrian there were no land predators. The fossils exhibit features nearly identical to those observed in modern scyphozoan strandings. Some event in the absence of shore erosion may have enabled the stranded jellyfish to be buried and these fossil imprints to form. It was during the Cambrian that animals with hard shells first appeared, enabling a rich fossil record to begin. Trace fossils such as these soft-bodied jellyfish are exceedingly rare. The medusae jellyfish fossils have so far been found in seven layers in the quarry, representing some 12 vertical feet of rock and corresponding to a span of time of about one million years. Hagadorn, et. al. state that the quarry's features are "consistent with an intermittently exposed intertidal and shallow-subtidal setting that was probably located in a shallow lagoonal area with limited wind fetch . . . . within a possible sandy barrier island system on the flank of the Wisconsin dome may have further restricted the environment, and severe tropical storms provide a plausible mechanism for medusoid stranding. 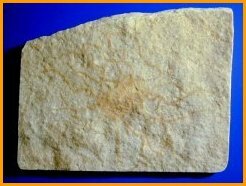 Climactichnites: Trace or body fossils? In a layer below the madusae are other unique and amazing fossils called Climactichnites, though whether they are track fossils or body impressions of a large Cambrian soft-bodied animal is yet shrouded in mystery. Climactichnites is a unique Upper Cambrian band-like fossil described as a trace found in sandstone formations throughout the northeastern and north-central US and southeastern Canada. It has been conjectured that the motorcycle-like tracks were made by a slug-like organism that secreted prodigious mucus as it moved over the shallow sand flats. In a poster at the Geological Society of America Annual Meeting (November 5-8, 2001), Damrow, et. al. propose that Climactichnites are equally likely to be fossils of body impressions of a gelatinous zooplankter that floated into shallow water where they were deposited gently across the extensive tidal sand flats. Shown in the picture is a large section with many overlayed Climactichnites. That they are overlayed is additional evidence that they are body impressions.It is interesting to note that when you first walk into the fossil section of the Museum of Natural History in downtown Washington you see a large plate of Climactichnites. The May 2002 issue of Geology presents a manuscript by MacNaughton, et. al. 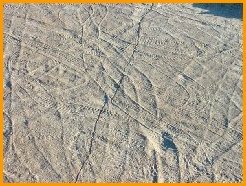 (First steps on land: Arthropod trackways in Cambrian-Ordovician eolian sandstone, southeastern Ontario, Canada. Robert B. MacNaughton, Jennifer M. Cole, Robert W. Dalrymple, Simon J. Braddy, Derek E.G. Briggs, Terrence D. Lukie, pages 391-394.) describing Arthropod trackways that might push back the record of the first arthropod landfall by as much as 40 million years. The trackways occur in an inactive quarry in the Nepean Formation (upper formation of the Potsdam Group in Ontario), 20 km northeast of Kingston that may date to the late Cambrian. The tracks occur in laminations that appear wind-rippled, indicating that the strata were deposited in an eolian (sand) dune field, probably in a marginal-marine setting. Still undescribed, and on a layer some ten feet below the madusae in the Wisconsin quarry are incredible trackway fossils (Diplichnites) that may push the date of arthropods on land still further back into the Cambrian. This layer is of rippled, medium-grained quartz sandstone surfaces of an ancient Cambrian tidal shoreline. Some areas have an incredible density of tracks, and tracks that are highly crisscrossed. It is believed these are the tracks of Cambrian, soft-bodied arthropods and are called Diplichnites. There is a broad distribution of spacing of individual tracks ranging up to 4 1/2 inches. Hence, some of these jointed-legged, creatures could have been of considerable size. The slab shown in the picture is one of the most interesting found in the quarry (click the picture to view more pictures). It measures 38 x 52 inches at its maximum width and height. There are two distinct types trackways on the slab. The widest dimples are called Diplichnites and the other is undescribed. Yet another layer of the quarry yields jellyfish that are smaller, but have tenacles in the familiar radial symmetry of Cnidarians, as shown in the picture. Jellyfish were some of the most ferocious preditors of the Cambrian marine environment, and may well have munched on the arthropods that left the trackways known as Diplichnites, described above. Also visit the Cambrian Shadows Theme Park at Fossil Mall.